It was a meeting between two legends of different sports as boxing legend Floyd Mayweather Jr. bumped into football superstar Cristiano Ronaldo. 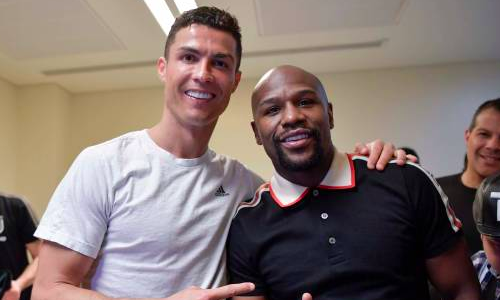 Mayweather, who likes to roam around the globe, whisked away to Italy this time, watching Ronaldo’s Juventus lock horns with Milan in the final of Supercoppa Italiana on Wednesday. Ronaldo scored the only goal of the match to help his team win the title for a record eighth time. And Mayweather later posed with some of the players from the winning team before holding the trophy in his hands for the shutterbug. Meanwhile, the 40-year-old is expected to fly back to the United States to witness the welterweight clash between Manny Pacquiao and Adrien Broner. This fight holds some importance for Mayweather, who had defeated Pacquiao back in 2016 and had been a mentor to Broner until breaking up on a bitter note not very long ago. Will we have a Pacquiao vs Mayweather 2.0?